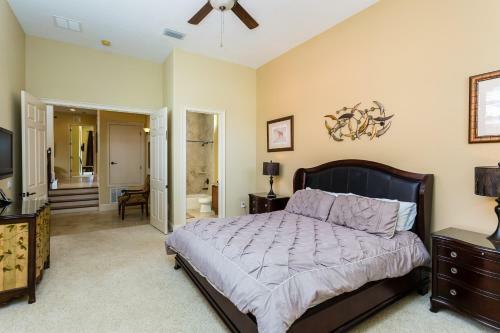 Castle Pines Villa in Kissimmee is a villa with 1 room. 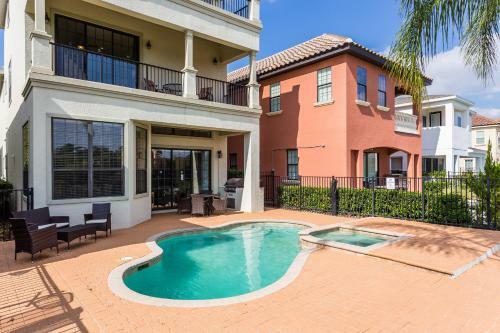 This 5-bedroom, 3-level Castle Pines villa is in Reunion Resort, 36 km from Orlando and features an outdoor pool with a hot tub and a furnished patio. Access is included to the Reunion Resort's 10 outdoor pools, children's activities, and bike hire. Guests can also enjoy a boutique spa, restaurants, and bars. The golf courses were designed by Jack Nicklaus, Palmer, and Watson. The community's water park, tennis, and golf facilities are available to registered house guests on limited days for a f...ee. 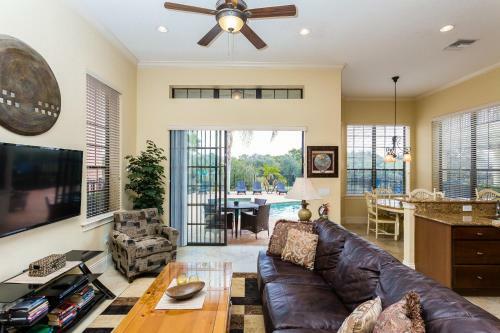 A golf course view, 2 balconies, and a pool deck are featured in this villa. A fully equipped kitchen, 8 flat-screen TVs, and an 8-person dining area are provided. 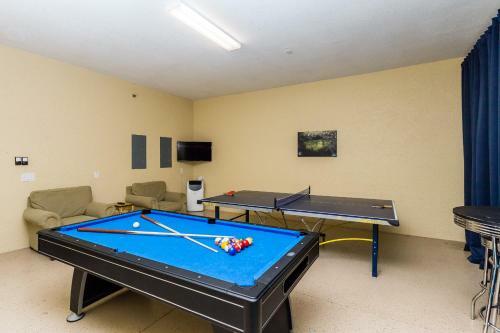 The 2 game rooms have a PS3 with Rock Band, table tennis, and pool table. 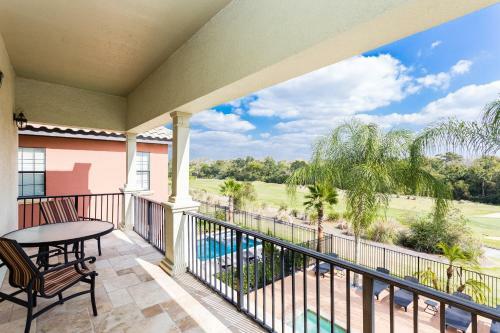 Kissimmee is 20 km from Castle Pines, while Lakeland is 43 km away. 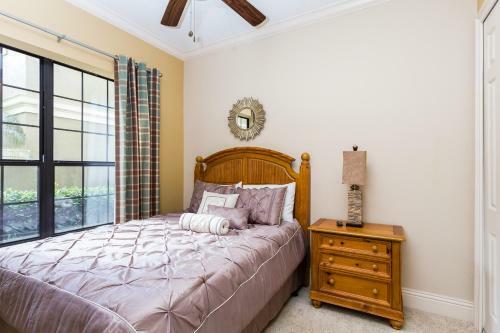 The nearest airport is Orlando International Airport, 34 km from Castle Pines. 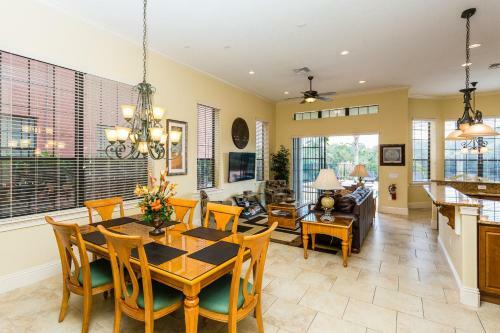 This 5-bedroom, 3-level Castle Pines villa is in Reunion Resort, 36 km from Orlando and features an outdoor pool with a hot tub and a furnished patio.... Access is included to the Reunion Resort's 10 outdoor pools, children's activities, and bike hire. Guests can also enjoy a boutique spa, restaurants, and bars. The golf courses were designed by Jack Nicklaus, Palmer, and Watson. The community's water park, tennis, and golf facilities are available to registered house guests on limited days for a fee. 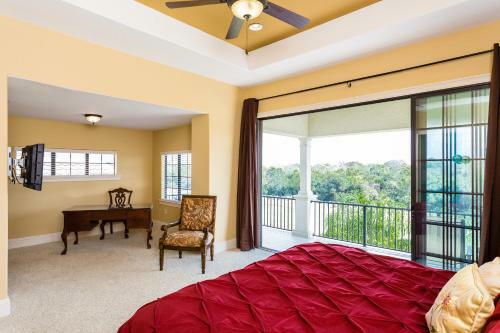 A golf course view, 2 balconies, and a pool deck are featured in this villa. 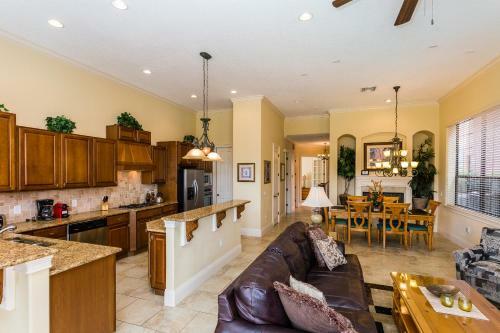 A fully equipped kitchen, 8 flat-screen TVs, and an 8-person dining area are provided. 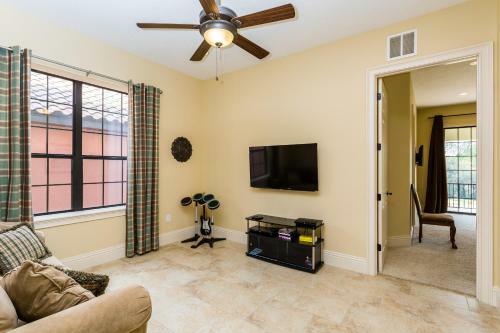 The 2 game rooms have a PS3 with Rock Band, table tennis, and pool table. 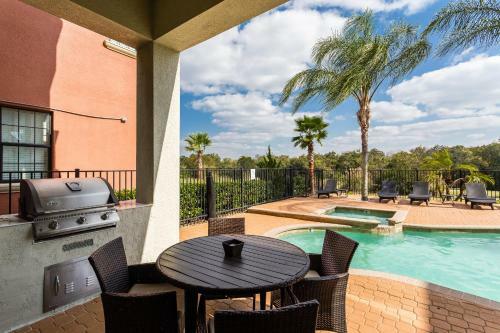 Kissimmee is 20 km from Castle Pines, while Lakeland is 43 km away. 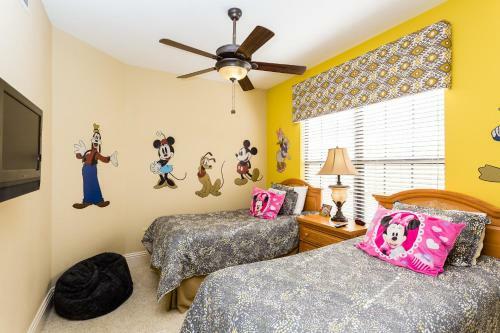 The nearest airport is Orlando International Airport, 34 km from Castle Pines. 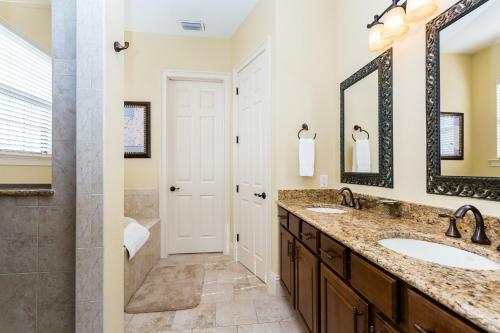 When would you like to stay at Castle Pines Villa? Guests are required to show a photo identification and credit card upon check-in. Please note that all Special Requests are subject to availability and additional charges may apply. Please inform Castle Pines Villa in advance of your expected arrival time. You can use the Special Requests box when booking, or contact the property directly with the contact details provided in your confirmation. Key pick-up is not required for this property. This property will provide guests with an access code prior to arrival. Please note to access the water park, tennis, and golf facilities guests must register at least 5 days prior to arrival for specific dates. Typically 1 day of resort amenity access is allotted per week. More registration days can be purchased for an additional fee. Contact the property for details. Please note the property cannot change, credit, or reissue resort amenity access dates. Facilities access is optional and requires an additional USD 25 fee for up to 8 guests. More guests will incur an additional USD 5 registration fee. Water park access requires an additional USD 15 per adult and USD 10 per child (2 to 17 years old) at the park entrance. The tennis court access requires an additional USD 20 court fee. Court reservations are required and are possible through the tennis court pro shop. Golf fees range from USD 125 (June to December) to USD 185 (January to May) and are subject to change. Contact the resort golf pro shot for more information. Golf tee times can be reserved up to 2 weeks prior to arrival. Pool heating: Please note that pool heating is available at an additional cost of USD 35 per day or USD 245 per week. Pool heating is recommended from October through March.